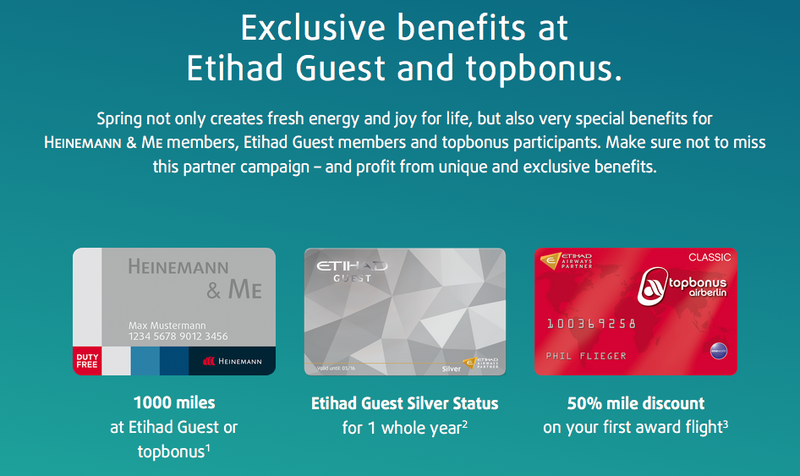 Receive 1,000 free airberlin topbonus or Etihad Guest Miles, Etihad Silver Elite Status with 1 flight and more! free miles. But seeing that Etihad Guest is a major player with airberlin they have been tossed into the mix and now you can choose from 1,000 free Etihad Guest or airberlin top bonus miles and if you aren’t an Etihad Guest member yet they’ll give you Silver Elite Status for a year when you complete your first Etihad flight (open to the first 1,000 people who register) or if you aren’t an airberlin top bonus member you can get a 50% discount on your first award flight. The 50% discount is awarded as miles returned to your account after you redeem. With awards starting at only 3,000 miles you’ll be half way there with this offer and airberlin’s 500 miles just for signing up for topbonus. If you are already a member of one of the programs you can choose to just take the 1,000 miles in that program or join the other program and take the additional bonus although you may end up with 1,000 stranded miles. miles programme card number within the afore-mentioned promotion period. you within 2 months automatically. meet the enrolment and flight criteria. miles for your first award flight will be reimbursed to your account.